Alfa Romeo has made some of the world's most beautiful sportscars. Here are five notable examples that take us back through the decades. Think of Italian cars and names like Ferrari and Lamborghini come to mind. 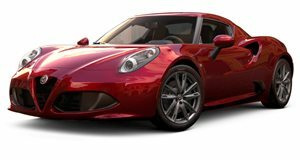 But while Alfa Romeo surely belongs in the same category, the fact of the matter is that it hasn’t done that many sports cars. Some small roadsters, sure, but most of its products have been sedans and hatchbacks. Still, Alfa has made a handful of proper sportscars – the kind for which Italy is best known. They might not be running circles around Ferraris and Lamborghinis, but they’re still about as awesome as they come. Our reverse chronology starts with the most recent: the new Alfa Romeo 4C. Initially previewed in concept form two years ago now, the 4C has now reached production. It’s about the same size as the MiTo hatchback, but a far more serious performance machine. In the middle of its carbon monocoque chassis sits a 1.75-iter inline-four, direct injected and turbocharged to drive about 240 horsepower to the rear wheels through a six-speed dual-clutch transmission. Its lightweight construction means a solid power to weight ratio that promises to keep it in stride with the Porsche Cayman and Lotus Evora. Before the 4C, of course, came the lusciously beautiful 8C Competizione. Built atop a Maserati platform and using its 4.7-liter V8 engine, the 8C may have lacked the handling balance you’d expect of a top-tier Italian supercar, but what it lacked in driving dynamics it more than made up for in style. Only 500 were made, followed by an addition 500 Spiders, keeping the 8C highly exclusive and sought-after. While the 8C was intended to relaunch Alfa Romeo in North America, that role has since fallen to the 4C instead, the eight-cylinder supercar sold instead through Ferrari and Maserati dealers Stateside. In 1989 the styling departments of Alfa Romeo and (its then-new parent company) Fiat teamed up with Zagato to design a quirky and beautifully ugly sportscar. What emerged was called the SZ (in coupe form) and RZ (the roadster). Based on the Alfa 75, the Zagato-bodied two-doors had a front engine/rear drive layout, but upgraded with a 210hp 3.0-liter V6. Just over 1,000 SZ coupes and less than 300 RZ roadsters were built. Save for Andrea Zagato's black coupe, most were red with black roofs and tan leather. A product of its time, these Zagatos are absolute icons, even if they’re not the most beautiful of Alfas. Expo 67 arrived in Montreal, Canada, at the height of the World’s Fair era. While countries invested enormously in their pavilions, Alfa Romeo unveiled a concept sportscar there that wore no nameplate but which was soon named by the public after the city. Designed by Bertone, it went into production a few years later, its 1.6-liter four replaced by a 2.6-liter V8 that sent just 197 horsepower to the rear wheels through a five-speed manual. Fewer than 4,000 were made, but despite it having debuted and been named after a North American city, it was never certified for use in the United States and Canada. Arguably the most beautiful of all Alfa Romeos past or present was the iconic 33 Stradale. The inspiration for the new 4C, the street-going version of the Tipo 33 racecar debuted at the Turin Motor Show in 1967. Ultimately only 18 were made, making it one of the most prized collectors’ cars in Alfa history. Desptie its relatively small 2.0-liter V8, it was still capable of keeping pace with much larger supercars from Lamborghini, Ferrari and Maserati. 230 horsepower sent it to 60 in just 5.5 seconds and on to a 160 mph top speed – veritable supercar performance for its time. But it's Franco Scaglione's design that endures.